Oatmeal is a whole grain so it’s healthy breakfast right? Yes it is a whole grain and when my clients are travelling for business or even pleasure and want to take some healthy options with them I will recommend they take some packages of the unflavored oatmeal as it packs easily in the suitcase and can easily be made in a hotel room. The flavored varieties of oatmeal however, are a whole different ball game. As soon as you start adding flavors it opens the door to the refined sugars, natural flavors (which are normally far from natural) and lots of other chemicals. 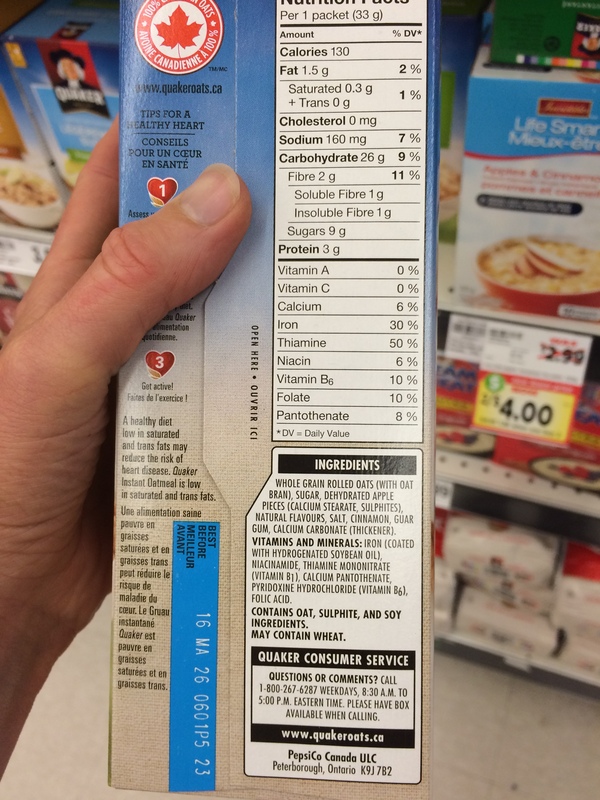 Check out the picture below, this is from a box of Quakers Apple & Cinnamon Oatmeal. 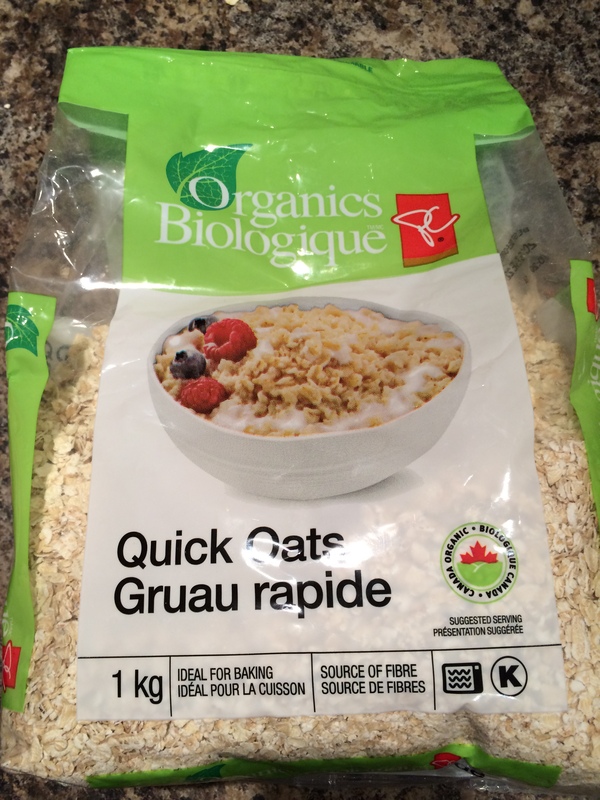 Whole grain rolled oats (with oat bran) – good so far! So what am I getting at? Well yes, ideally I want you to make your own oatmeal at home using either rolled oats or even quick cook oats (see the President Choice ones I buy below). 1 tsp of maple syrup or raw honey for sweetness or you could add raisins or some other dried fruit instead. Look at the difference. Which one do you think contains more real food? I know I would rather have the real apple than dehydrated apple with calcium sterate and sulphites added – yuk! Make overnight oats (see recipe below). I understand time is precious but so is your health. Sometimes making those healthier choices means that you either spend a little extra time in the kitchen the night before or go to bed a little earlier so you can get up a little earlier to make yourself a healthy breakfast. Give it a try! Stir in the oats, almond milk, and vanilla. Cover and refrigerate overnight. In the morning, stir the oat mixture to combine. If your oats have a runny consistency even after they soak, simply stir in an additional 1 tablespoon chia seeds and place the mixture back in the fridge until it has thickened up. If the oat mixture is too thick, simply add a splash of milk and stir to combine. Next > A Sneak Peek In My Fridge!